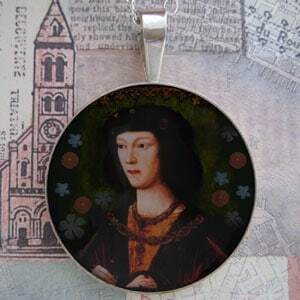 This beautiful, unique and collectible pendant features a collage by Tiffini Elektra (TartX) of a portrait of Henry Tudor, Prince of Wales, later to be crowned Henry VIII. The portrait is by an unknown artist and depicts Henry when he was eighteen. The flower embellishments are taken from Henry's Book of Hours.